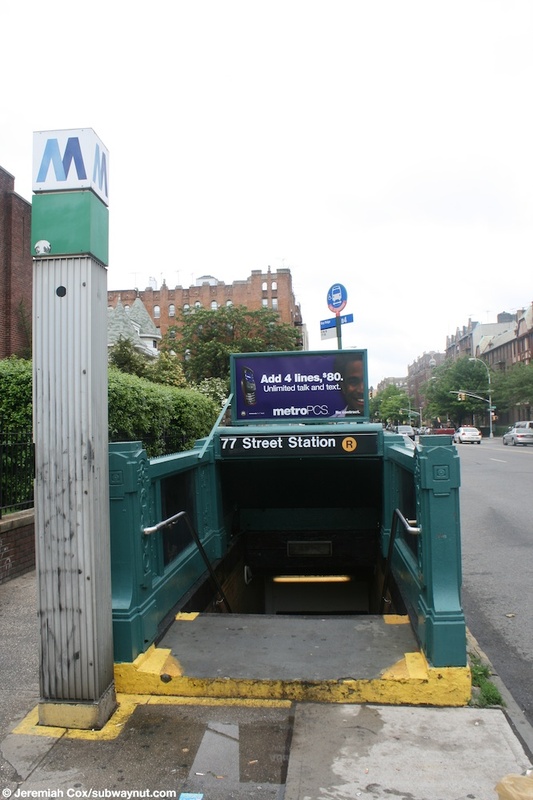 77 Street is a typical two side platform station towards the southern terminus of the currently two tracked BMT 4th Avenue Subway Line. 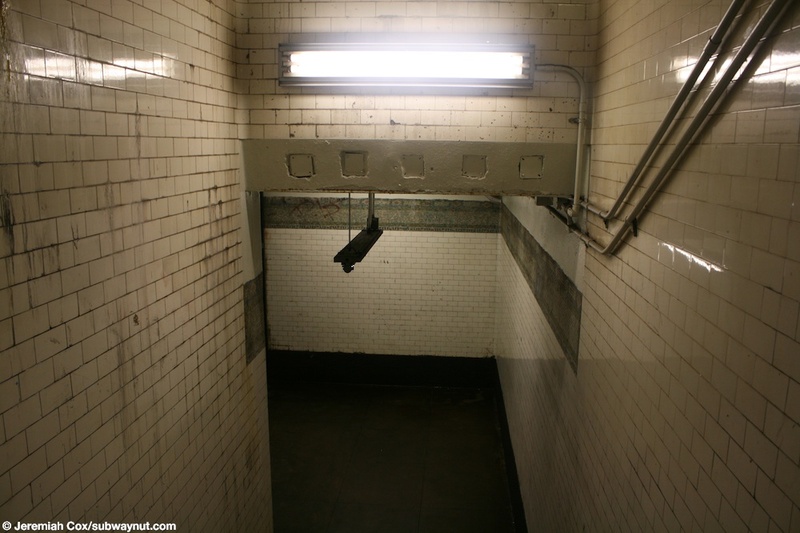 The station got the awful 1970s cinderblock renovation that covered all of the original trim line along the station's platforms. 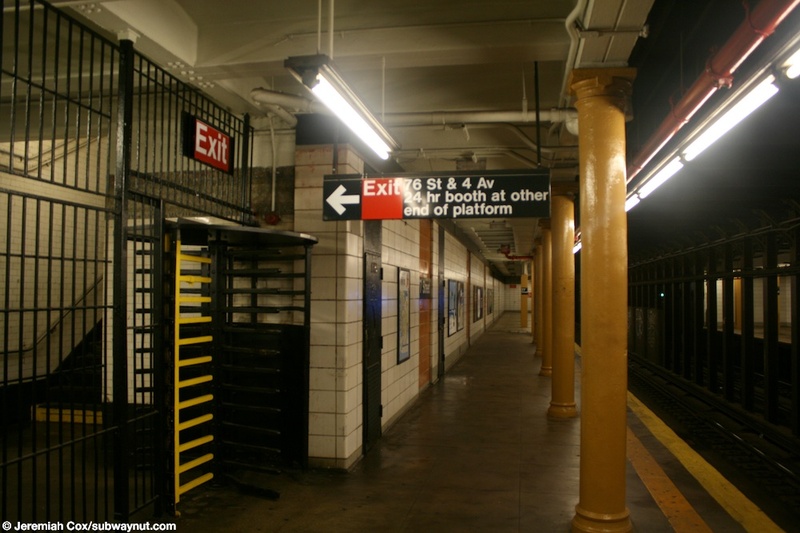 There are the standard grey bocks with little bright orange indentation areas where the station's name signs are and text painted onto the walls that mostly say exit and an arrow pointing towards the station's main exit, a small mezzanine area south of center of the platform. 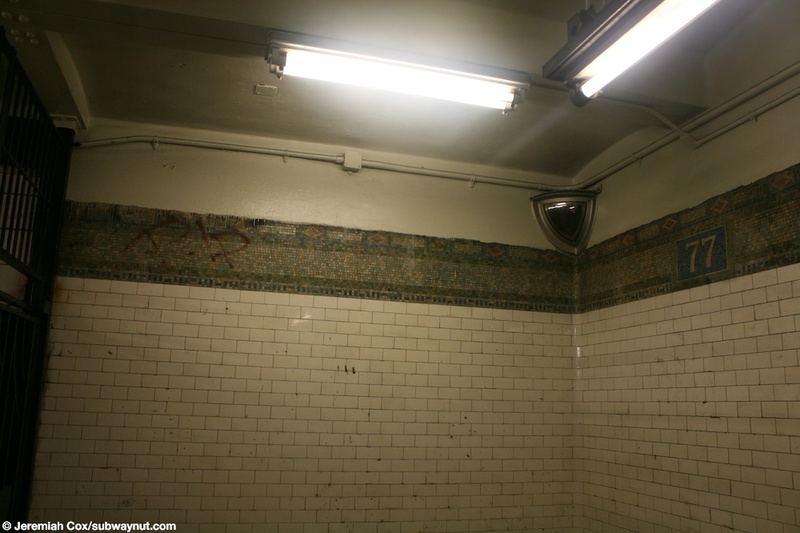 This mezzanine still has white tiled walls for some of them, with an old terra-cotta sign for a long defunct Newstands, as well as sings form Men and Woman, restrooms that have long been closed and their signs blacked over with paint. 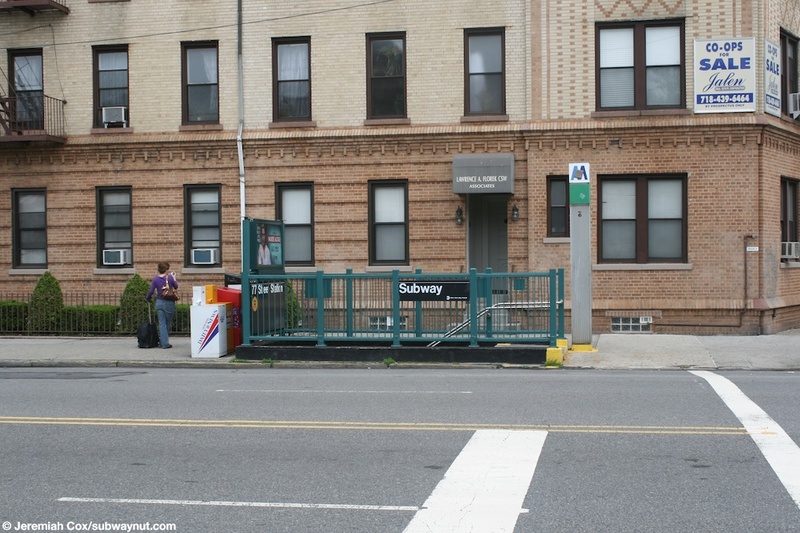 There are also blacked over mosaic directional arrow signs for the uptown (Bay Ridge-bound, opposite of Manhattan directions) and downtown (Manhattan-bound) platforms. 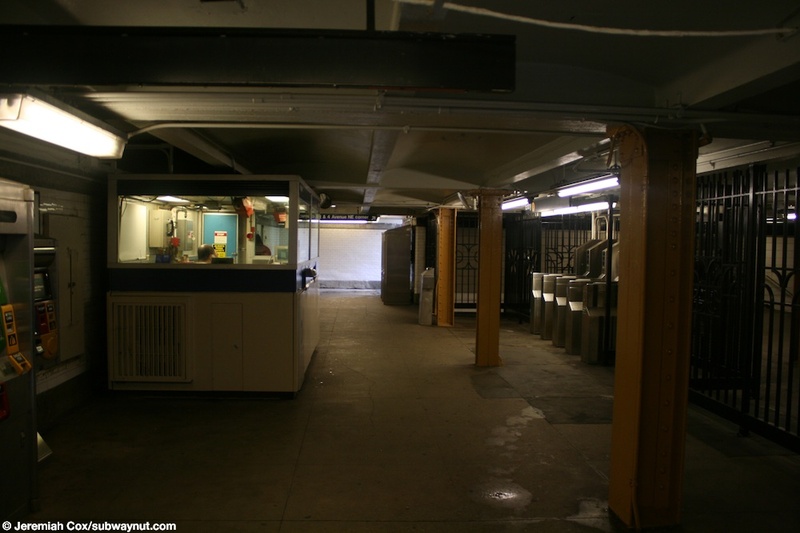 This mezzanines has a single staircase to either side of 4 Avenue and 77th Street. 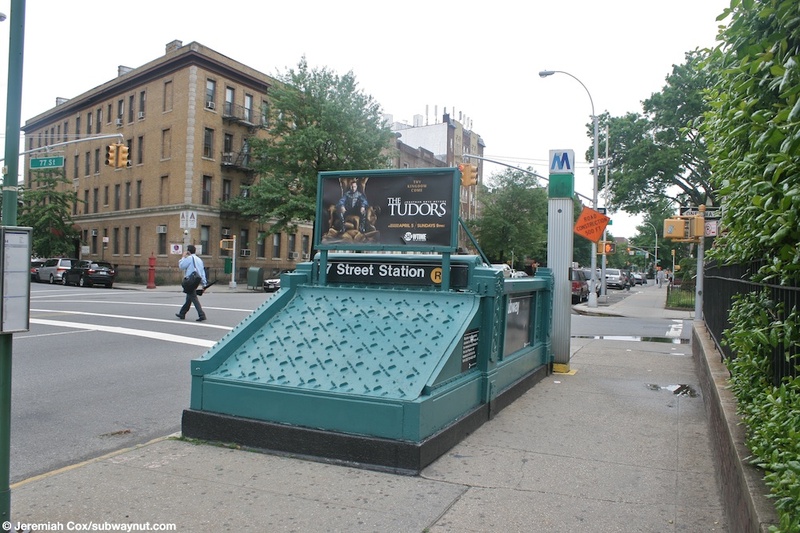 One of these street-level staircases is still an original 1916 ornate staircase with decorative features, have no idea if it was painted green originally. 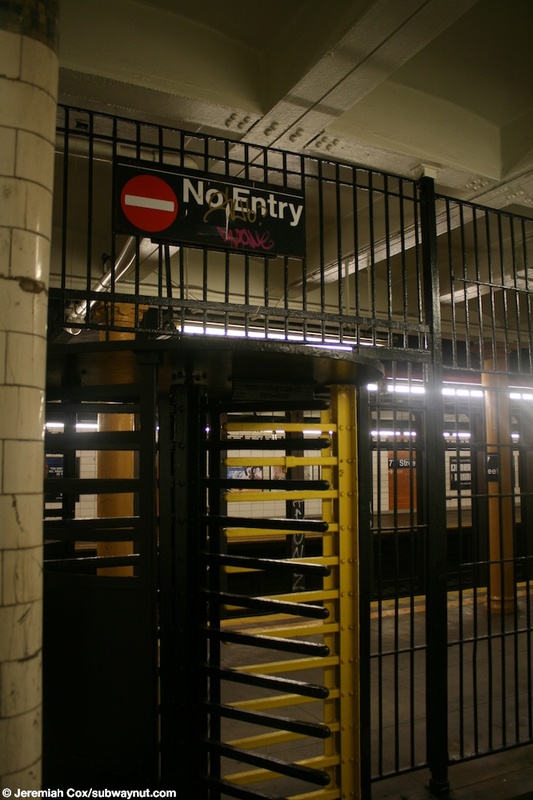 There is a secondary High Exit only turnstile exit towards the southern end of the uptown, Bay Ridge-bound platform. 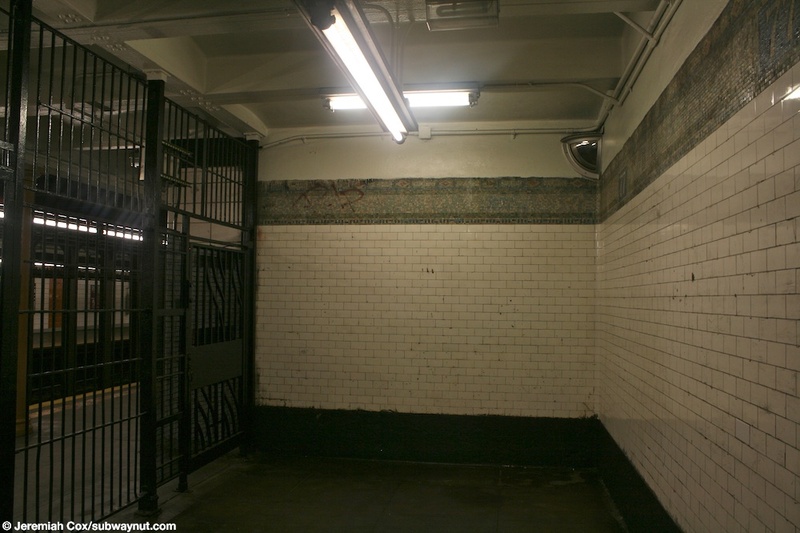 In the little area before the long, double floor staircase up to the street, the original 1915 trim band is visible (the only place it is, along the platforms), with 77 tiled within of it. 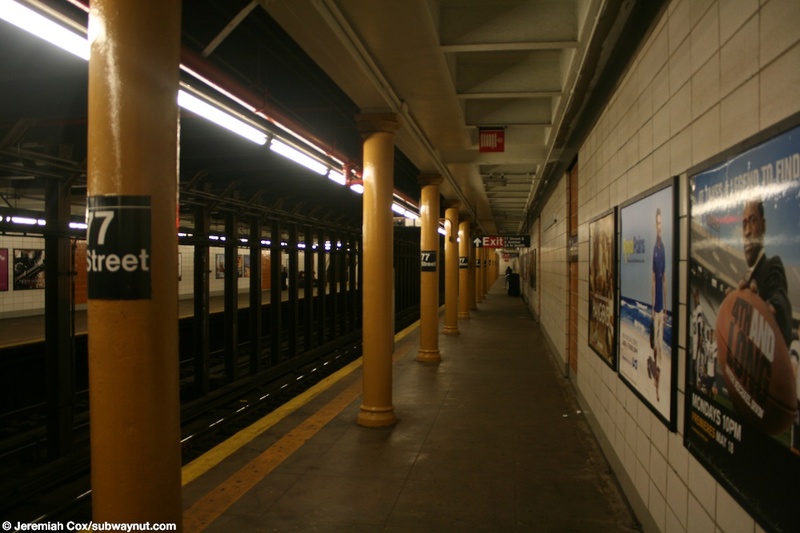 Both platforms also have columns along their length, all are painted yellow and are round for most of the platform's length except towards the end where the platform was extended to accommodate ten-car trains and those are the standard I-bean ones. These columns all have 77 Street signs on them. 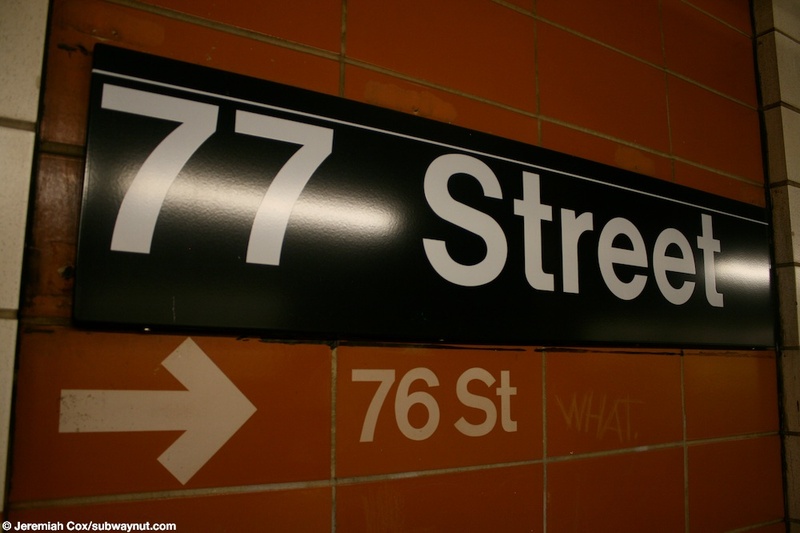 (77r1) A close up of a 77 Street platform sign on the orange cinderblock indentations along the platforms, this one is on the Uptown, Bay Ridge-bound platform between its two exits because the arrow beneath it points towards the exit to 76 St.
9 June, 2009 (77r2) A close up of an arrow for the exit to 77 St in the orange cinderblocked portion of the platform at 77 Street. 9 June, 2009 (77r4) The High Exit Turnstile on the Bay Ridge-bound platform for the exit to 76 Street. 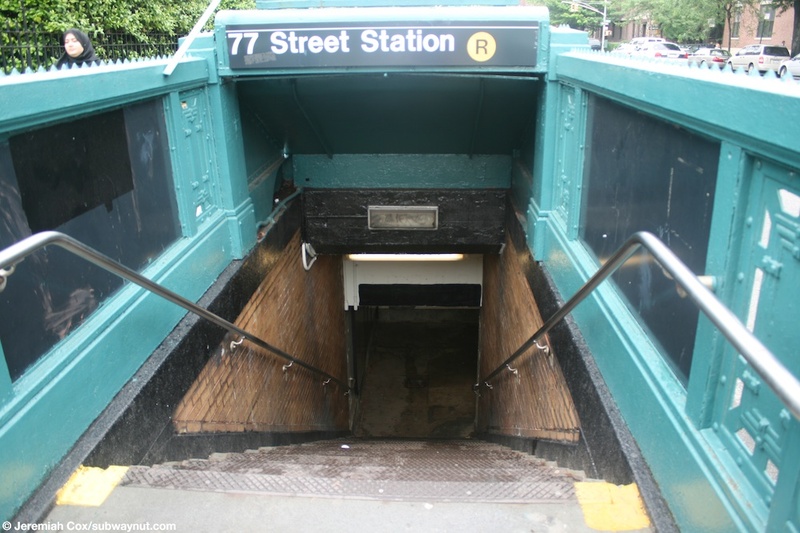 (77r5) The original greenish (and quite faded) trim-line in the landing area after leaving the subway at the 76 exit only exit on the Bay Ridge-Bound platform. 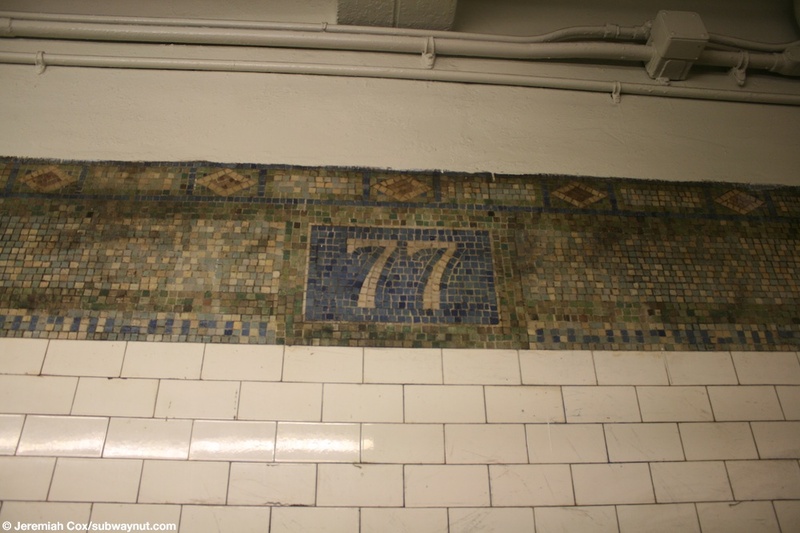 9 June, 2009 (77r6) A close up of the ornate 77 in white on blue mosaic tiling on the trim line of the small landing before the staircase at the 76 Street exit only exit on the Bay Ridge-bound platform. 9 June, 2009 (77r7) A wider-view of the intact section of platform trim-line at 77 Street at the base of the staircase up from the High Exit Gate exit to 76 Street. 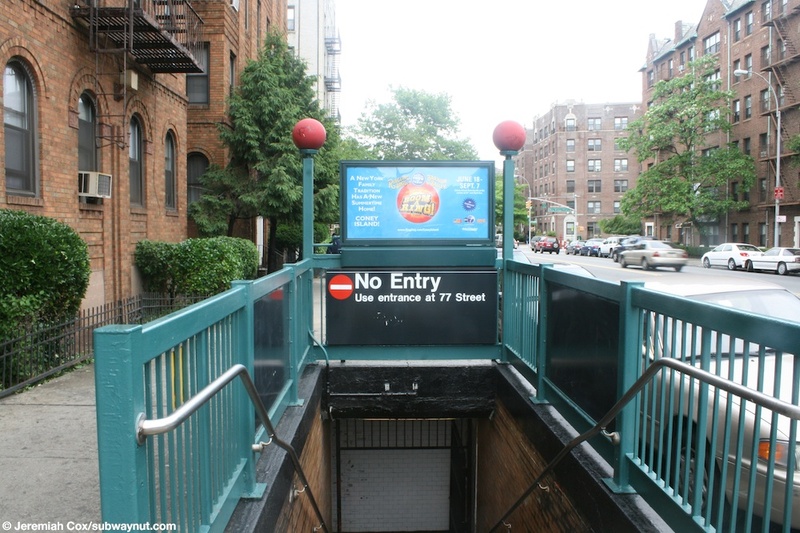 9 June, 2009 (77r8) The No Entry sign on the landing of the exit only exit to 76 Street at 77 Street. 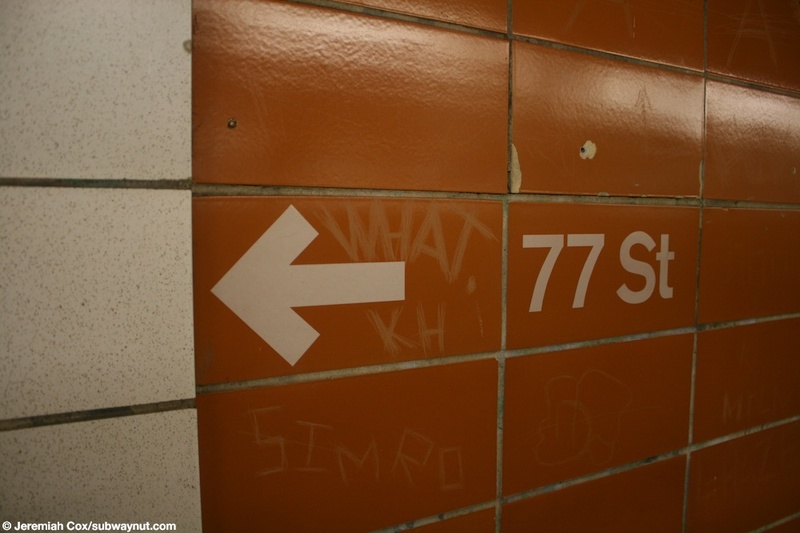 (77r9) The staircase up to 76 Street also has original white tiling, the only area still with its trim line is visible in this view, the bottom of the landing outside of fare control from the High Exit Turnstile. 9 June, 2009 (77r10) The top of the No entry exit only exit from 77 Street at 76 Street. 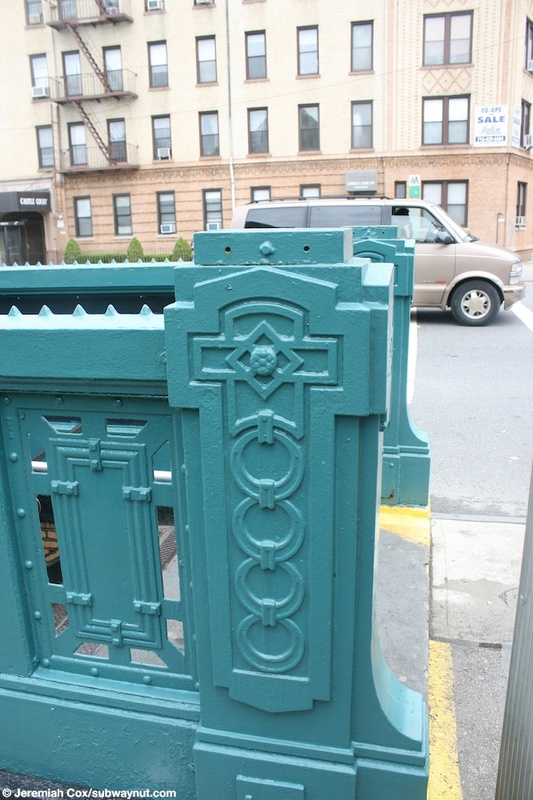 9 June, 2009 (77r11) Approaching the original, ornate 1910s platform entrance to 77 Street. 9 June, 2009 (77r12) A close-up of some of the detailing of the ornate 1910s platform entrance to 77 Street. 9 June, 2009 (77r14) Looking down the stairs of the ornate, original 1910s street-level entrance to 77 Street. 9 June, 2009 (77r15) Looking across 4th Avenue at a more conventional entrance to 77 Street. 9 June, 2009 (77r16) Approaching the token booth in the small fare control area to 77 Street.